The International Caravan San Tropez Resin Wicker Dining set was a great purchase. Our set is on an area of our porch that gets full exposure to sun and weather and it still looks like new! It’s a great investment for outdoor dining and added seating during parties. I highly recommend this set. Gather friends around this International Caravan five-piece patio set to enjoy your specialty barbecue creations on a sunny afternoon or a glass of wine at sunset. The PVC wicker pieces come in your choice of eye-catching colors, and the aluminum frames provide sturdy support even if your outdoor party gets a bit rowdy. The table in this outdoor patio set has a convenient center hole, so adding an umbrella is easy. Dimensions 48.0 In. X 48.0 In. X 40.0 In. This five -piece patio set is soooo beautiful! It's a must...can't beat the price too. I shopped around for a similar set,and nothing compares to the price on "O". It comes in a big box,but make sure you ask the delivery driver to open it up, & have him pull out the chairs & boxed up table too. Have him also open the boxed up table,just to make sure all the pieces are all there & the glass on the table is not broken. I know people have complained about the box missing some pieces,but take the time to ask the delivery driver to open up the box,and make sure it's not missing any legs or broken pieces too. Plus I bought the choc. color,& it's rich in color too. Along with really big chairs too,nice & very comfortable too. I live in FL,and looking forward to enjoying the set out in my lani. Bottom line...I'm sooo pleased with this set,it's as nice as any type of set you can purchase at an expensive patio store. I have had this set for about two months now. It matches a set I bought last year from Overstock that includes a two seat couch, coffee table and two side chairs. Both sets are holding up very well. They are sturdy and comfortable (with additional cost seat cushions). I do cover them when I am away for more than a few days. My only complaint (and the reason I do not give it 5 stars) is that in some cases, some of the "wicker" is not properly terminated. That is, the ends stick out from the "topside" of the chair rather than having been routed back to the bottom side. The strip of "wicker" was too short for the place it was put. This is rare, but noticeable.Other than that, I am very happy with the color, sturdiness, and aptness for my dock location. The table & chairs just arrived. Shipping was fast. It seems very well made, but I expected seat cushions to be included as in the photo. The set needs cushions so expect to have to buy them. I like the material as I plan to place them on a screened porch where my last set of all wick lasted 7 years. I expect longer use of this with resin and aluminum. There is minimum assembly only to the table. The chairs will be comfortable with the cushions and the table has plexiglass, so not breakage. So far I am pleased. I have this patio set on a covered porch. It looks nice. The problem is that one of the chair legs broke this morning. The aluminum leg sheared off and sent my daughter to the ground. BE CAREFUL WHEN YOU SIT IN THE CHAIRS. THEY CAN COLLAPSE! The aluminum beneath the plastic wicker is extremely thin. I got the dark brown. Delivery service was exceptional. Simple assembly required only for the table, just took a few minutes. It was expensive but so happy with this I won't complain as I am a believer of you get what you pay for. I have only put it to use recently, and expect it to wear for years. If not I will be saying so, as I have other sets like this purchased at local big box stores that have lasted for years in the various weathers of the Seattle area. This set is being used in Las Vegas with the other weather extremes. The table and chairs are lovely with a finished leg that shouldn't scratch our metal decking. The chairs are light weight and comfortable. The only problem was that part of the wicker was coming loose on a panel that goes under the table. My husband secured it with vinyl locks. It's too soon to truly test durability. 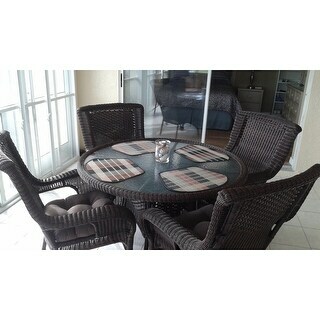 I am so pleased with the wicker dining room set; it fits so well in my new sun room. I also love the durability of the set; seating is very comfortable. Thank you, Overstock, for such a wonderful product! We just added a 3-season room to our home and looked for a dining set. We were hesitant about ordering a set online but were very pleased with the delivery and the set is perfect. It is a good quality and looks like it compares to those priced much higher. Free delivery is a plus! Order this wicker set online after checking local stores and found this was much more reasonable. The quality of this product is excellent. We have gotten many compliments on it. I would like to order the matching settee and cocktail table, but it is only sold as a set of 4 with 2 chairs. Highly recommend this patio set. Terrible quality. Rust already. Pieces of resin breaking of already, hardly used. Very difficult to assemble table. Very comfortable chairs and table. They came tightly stacked so they could be stored that way. Seems very sturdy, even for plus-sized people. The set arrived quickly. After unpacking it all was well with one exception. One of the chairs is severely warped, there is no way to level it. So, if you need a table and 3 chairs it's a great deal, not so good if you want 4 good chairs. The cushions I ordered separately are fine. This is a nice patio set for the money! The best patio set I could get!! This patio set is absolutely the neatest set I've ever seen!! Goes well with my log house and is high quality. Water proof and very well made!! I bought this set years ago; it has never been under any cover and still looks and performs beautifully. This set with aluminum frames should do well for some time. One chair arrived with some strands of the weather wicker broken but I was able to glue them. 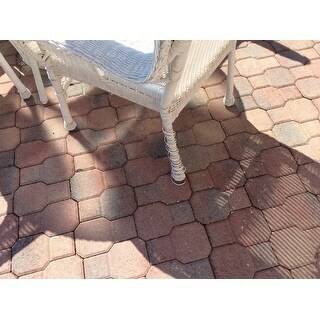 I had to replace my old patio set and found it difficult to find one with good quality. I looked on Overstock hoping I could find something similar to what I had. To my surprise I found this set which is very nice. It looks great on my deck.. Just what I was looking for! Looks great on my patio and very comfortable. We bought this set four years ago. I love the look and size of the set, but I feel it should last more than 4 years. 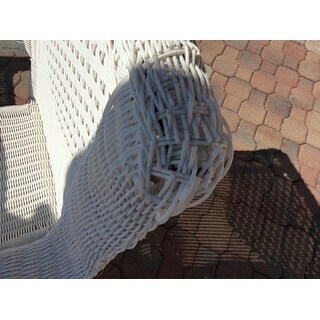 The plastic wicker is very brittle and is falling apart. The material on two of the legs are unraveling and wicker pieces are breaking all over the set. Extremely disappointed. this set went perfectly with newly refurbished deck. seems sturdy enough and also went perfect with brown umberella my wife purchased. "What size seat cushion is recommended for this chair?" "What is the size of the umbrella hole?" "What is the average weight for plus sized people? Are the chairs and table already assembled in the box? Let me know- rebecca"
The patio set does not arrive assembled. We apologize but do not have the weight limit information for this set. "Is this set made to be comfortable without cushions? No cushion in pics and no mention of the cushions except in one question"
Hello Mightyquint, this set does not include cushions. In my opinion, this set would be comfortable even without cushions. Thank you for shopping with us! I love the casual, but elegant look. Alum frame. 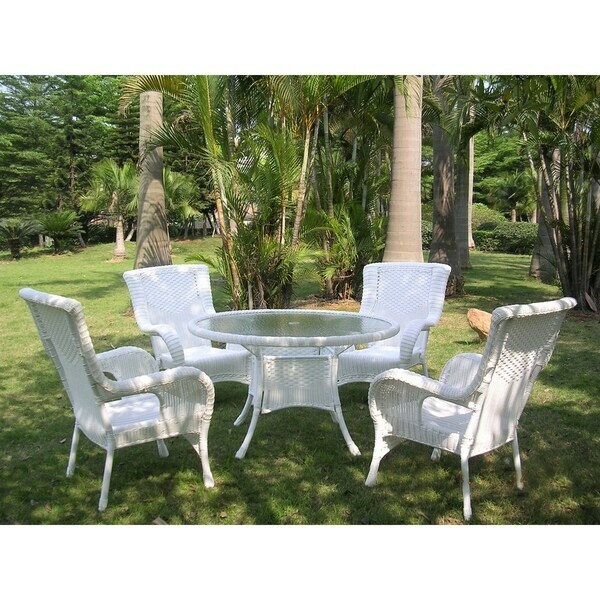 stackable chairs, Round glass top table with umbrella hole and its all weather wicker to withstand Wisconsin weather. "What is the table top made of - is it tempered glass?" Hello janei526, thank you for your inquiry. Unfortunately, the information you have requested is currently unavailable. You will receive an email notification once an answer is posted. Have a great day. can you recommend an umbrella for this set? also do you need the umbrella stand or is there an attachment on the table for the umbrella? "What are inside dimensions for cushions?" Hello parlaisvous, the dimensions of the cushions made for these chairs are each 19 inches long x 19 inches wide x 5 inches high. have a great day!